Save time with Advance Tickets! 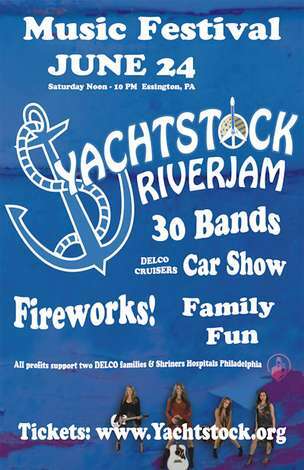 The Yachtstock RiverJam is the highlight of Yachtstock's annual fundraising that benefits Shriners Hospital Philadelphia and two Delaware County families with children with grave/chronic illness. This June 24th we celebrate our 19th year. The outdoor concert is held on the scenic banks of the Delaware River in Essington, PA (just 2 minutes from I95 Exit 9) just south of Philadelphia International Airport. After a full day of music and fun we will enjoy fireworks courtesy of Tinicum Township. Local bands will bring a mix of country, classic rock, pop, ska, swing, funk, world, and soul, sure to please almost anyone -- with 30 bands on 3 stages at two outstanding venues (West End Boat Club & the adjacent Corinthian Yacht Club). Yachtstock’s 2017 headliners, rising "Outlaw Country" stars, THE HIGHWAY WOMEN and Country Charting performer and renowned songwriter GEORGE DUCAS (hit writer for Garth Brooks, The Eli Young Band, Trisha Yearwood, & many more) are certain to be crowd-pleasers. They will be joined by 30 more bands with a new and improved lineup of local and regional acts at Harrah's World Stage @ The Corinthian and the H&H Heating & Air RiverView Stage. After our headliners rock the Hamels Foundation RiverJam stage we will enjoy fireworks on the river at dusk. In addition to great bands, vendors, and food and refreshment (including adult beverages), there are many activities for the whole family -- including DELCO CRUISERS CAR SHOW at Governor Printz Park, and many other happenings at our venues, including a Family Fun Circus, visits from the famous Shriner clowns, Moon Bounce & Super Slide, face painting, pony and carriage rides, silent auctions, 50/50 raffles, and more.